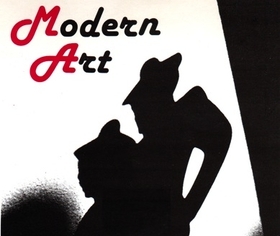 The Modern Art (sometimes spelled Mødern Art) was a band-project formed in the early 80’s by Gary Ramon, also known for his band-projects WeR7, Mystery Plane, and latterly, Quad and Sun Dial, as well as working with Current 93 and Coil on their "Astral Disaster" album. The sound is very unique as it combines the classic Minimal/Synth and Drum-elements with psychedelic/guitarrock that built the fundament for the later works as Sun Dial. The band had a loose lineup and released two studio albums (one self-released called „Stereoland“ from 1987 and one on the german Out of Depression-Label in 1989) and a number of self-produced cassettes on Gary’s own Color Disc & Tapes label.